Gates also made reference to the recent SDA Conference in Brussels where he stressed once again the need of better support NATO, arguing the Libya operations demonstrated America’s allies suffered from serious gaps in military capabilities because of their failure to spend enough on their own defense. “America’s European allies”, Mr. Gates said in Brussels, are “apparently willing and eager for American taxpayers to assume the growing security burden left by reductions in European defense budgets.” ( Full Text of Gates’s speech on NATO here). Mr. Gates blasted the alliance for failing to develop intelligence and reconnaissance assets, forcing NATO to rely on American capabilities to develop targeting lists. “The most advanced fighter aircraft are little use if allies do not have the means to identify, process and strike targets as part of an integrated campaign,” Mr. Gates said. Mr. Gates said the alliance had outperformed his expectations in Afghanistan. But even in the face of increased operations there, NATO defense budgets have fallen, forcing allies to put off critical modernization programs. In the 10 years since the Sept. 11, 2001, terrorist attacks, U.S. defense spending doubled. European defense spending, Mr. Gates said, fell by 15%. 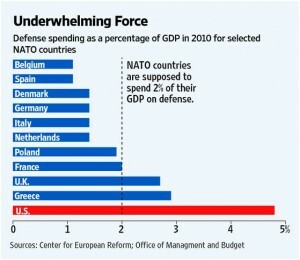 NATO members are supposed to spend 2% of their GDP on defense, but only five of the 28 allies meet that target.